‘Sea When Absent’ is the third full-length release from A Sunny Day in Glasgow, but it is in many ways an album of firsts for the loosely Philadelphia-based band. 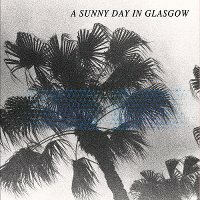 After a series of lineup changes surrounding previous album ‘Ashes Grammar’, this LP marks the first time A Sunny Day in Glasgow have recorded as a full band; their prior recordings had mainly been the work of primary songwriter/instrumentalist Ben Daniels and engineer/multi-instrumentalist Josh Meakim. On ‘Sea When Absent’, vocalists Jen Goma and Anne Fredrickson have stepped in to write lyrics, melodies and string arrangements, while the band’s rhythm section, bassist Ryan Newmyer and drummer Adam Herndon, interlace the component parts of songs being composed from several different corners of the world. While Daniels contributed from his Sydney, Australia home and Newmyer telecommuted from Brooklyn, Meakim recorded and engineered the album in Philadelphia alongside producer Jeff Zeigler (The War on Drugs, Kurt Vile). Working with a producer was another first for the band, but probably a necessary one, as the band attempted to move from its self-described “ambient maximalism” into a more approachable rock-oriented sound. The most notable change is in the recording of the vocals, which have been shifted to the forefront, allowing Goma and Fredrickson’s melodies to provide much-needed hooks into the thick and sprawling instrumental textures. The lightly singable chorus to ‘In Love With Useless (The Timeless Geometry In The Tradition of Passing)’ allows a bit of a respite from an otherwise unrelentingly bright barrage of sound. (Take a listen and read the lyrics in the video below.) The amorphous tracks in the middle of the album create a blurry psychedelic ambience with flashes of brilliant color, such as the slight pentatonic feel in the instrumental interludes of ‘Crushin’’ and the diffusive impressionism of ‘Never Nothing (It’s Alright [It’s Ok])’. Final track ‘Golden Waves’ is a mishmash of sounds and styles, leaving the album in a state of mutable vacillation. The songs on ‘Sea When Absent’ are never restricted by melodic form or lyrical direction; instead, the vocal lines and guitar riffs are woven into the constant motion of a deliberate musical evolution. As a result, the tracks are mesmerising, but a bit unwieldy for a casual listen. (The song titles are equally awkward. Of the 11 tracks on the album, 7 have parenthetical subtitles; one of those was too long for the album information data in iTunes, one is in Japanese, and another contains a sub-subtitle in square brackets.) Even with the band’s stated intent to refine their focus, ‘Sea When Absent’ is still a concentrated stream-of-consciousness, if such a thing exists. ‘Sea When Absent’ is available now on Lefse Records. Alongside the album, A Sunny Day in Glasgow have also released a new EP called ‘No Death’, available exclusively in independent UK record shops. The EP features two new tracks and three remixes. You can sample the Ice Choir remix of ‘Bye Bye, Big Ocean (The End)’ below.